It’s a new year with new projects! This first one kind of ties in with the Sabre Cafe project. It’s a brake light flasher that can be used on a car or motorcycle. I’ll be mounting this one up on the Sabre. It’s a circuit that uses a 4060 timer chip. The 4060 is an excellent integrated circuit for timing applications. Its ten active high outputs can give time delays from few seconds to hours. With a minimum of external components, it is easy to construct a simple but reliable time delay circuit. 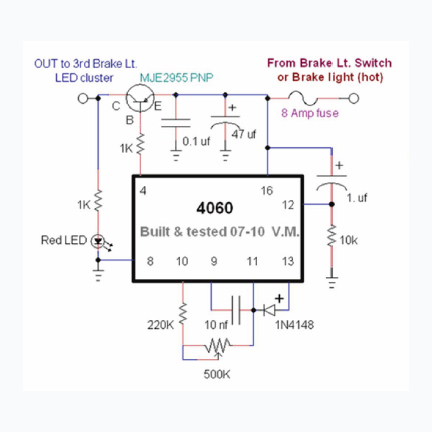 This brake light flasher kit came from Tayda Electronics. Cost is only $7.99 and well worth it. The parts come to you in a few days time in a nicely packed box and you get an email with a link to the instructions PDF file. It’s a pretty easy build and the only extras I had to supply were solder and a plastic enclosure for everything. Build time was part of an evening and installation on the bike was a snap. Below you’ll find the project video, a parts list and a schematic. I am not interested in G+ and therefore no longer able to comment on your videos via Youtube. Having this reply box on your blog works great. That’s good enough for me, but if you want a forum on top of that, then I’m all for it. I look forward to your upcoming videos. Keep up the good work, and greetings from Vancouver, Canada.